With her kind and nurturing demeanor, Wendy is there to help the lost boy — or girl — in all of us. Yes, Wendy is both blessed and cursed with kindness. Blessed because everybody likes her, and because her sweetness and optimism insulate her from life's disappointments. Cursed because people have a tendency to walk on her. She's the kind of girl who lets other kids copy her homework over and over, even if they never reciprocate. And when she gets a crush, she showers her beloved with affection, gifts, and late-night emotional support, all of which the love object can lap up — without giving anything back. At some point, Wendy will learn who's actually worthy of her nurturing — but until then, her oh-so-available heart may get crushed a few times. I base much of this on Wendy Darling, Peter Pan's friend and, apparently, the girl responsible for popularizing the name. Wendy took care of her brothers before Peter's arrival — then she went to Neverland to take care of the Lost Boys. Eventually Wendy eschews the fun of Neverland — which may not have been as fun for her as for Peter — in favor of domesticity. She returns to London and has a child of her own. 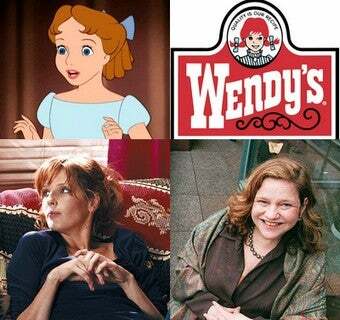 Other fictional Wendys also fit the bill. Kelly Reilly's character in L'Auberge Espagnole is an endearing English rose, though her affair with an American reveals she can be a heartbreaker as well as heartbroken. And of course there's the titular Wendy of the fast food chain, a little red-haired girl whose purity inspired in poet Joe Wenderoth some seriously impure thoughts, which are NSFW but hilarious. Real Wendys pose more of a challenge to my model. Sister Wendy Beckett, art expert and nun, seems sweet — but playwright Wendy Wasserstein was by all accounts a feisty lady. I doubt she was anyone's doormat. Wendy may be due for a comeback — the name currently languishes at #458 in the US, down from a peak of #48 in the sixties. Given its history, prospective parents of Wendy's might want to take a few precautions, like early viewing of Wasserstein's plays, or maybe kickboxing lessons. Because no truly kind person should go out into the world unarmed.